WHY HIRE A BOARD CERTIFIED LAWYER? Less than 7% of Florida lawyers are board certified. Certification is important to you because it assures you that a specific lawyer’s skills, integrity, and experience have been carefully scrutinized by a national board of experts and found to be exceptional. The certified lawyer knows how to handle insurance companies that are trying to pay you as little as possible. And equally important is the fact that the insurance companies know that a board certified lawyer has the skill and experience to take the case to trial if the offer is unfair and they will try your case. Moreover, these lawyers are the only ones that can call themselves specialists in their respective fields. A Board Certified Civil Trial Specialist sticks what he knows and does not handle Criminal or Family or Real Estate matters. Your most powerful advantage is a lawyer known to be a highly skilled trial lawyer. The odds are much greater that such a lawyer will be able to successfully negotiate an out-of-court settlement for you. Litigation is often times compared to war. In litigation, as in war, the side with the greatest skill and experience is usually able to avoid conflict because the opposition is not willing to risk the consequences against such a capable opponent. 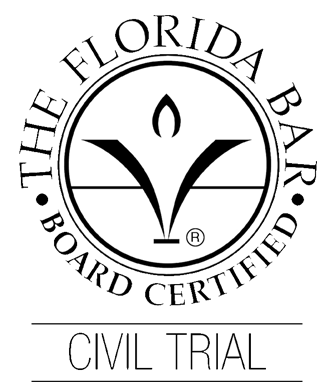 WHAT MUST LAWYERS DO TO BE “CERTIFIED” BY THE FLORIDA BAR IN CIVIL TRIAL? Civil trial law is the practice of law dealing with litigation of civil controversies in all areas of law before state courts, federal courts, administrative agencies and arbitrators. Jorge P. Gutierrez Jr. of The Gutierrez Firm has been Board Certified in Civil Trial by the Florida Bar since 2013. Why should it matter to me whether my lawyer is a board certified trial lawyer? I want my case resolved without having to go to trial. Virtually 98% of civil cases never actually go to trial. This is because they are settled out of court. What will motivate your opponent to want to settle with you out of court? If you are represented by an experienced trial lawyer who is making a reasonable request for settlement on your behalf, the opposition knows it would probably be foolish to take the case to trial against an experienced, skilled litigator. On the other hand, if the opposition knows something you don’t know – that your lawyer has virtually no experience in court or has demonstrated a serious lack of skill in court – the opposition is much less likely to meet your settlement demands because they feel confident about their chances of success against your lawyer in court. For these reasons, the most powerful advantage you can have is a lawyer who is known to be a highly-skilled trial lawyer. The odds are much greater that such a lawyer will be able to successfully negotiate an out-of-court settlement for you.